Until the last few months of the Civil War, Ft. Fisher kept North Carolina"s port of Wilmington open to blockade runners supplying necessary goods to Confederate armies inland. By 1865, the supply line through Wilmington was the last remaining supply route open to Robert E. Lee"s Army of Northern Virginia. When Ft. Fisher fell after a massive Federal amphibious assault on January 15, 1865, its defeat helped seal the fate of the Confederacy. Visitors are invited to tour the remains of the fort"s land face featuring an impressive reconstruction of a 32-pounder seacoast gun at Shepherd"s Battery. Shaded by gnarled live oaks, a scenic trail leads tourists from the visitor center past the gigantic earthworks and around to the rear of the fort. Guided tours and wayside exhibits provide historical orientation. Other exhibits include items recovered from sunken blockade runners. At the dawn of the American Civil War, the Confederacy took control of a neck of land in southern North Carolina near the mouth of the Cape Fear River and constructed what was to become the largest and most important earthwork fort in the South. Two major battles were fought there, and many Union soldiers received the Congressional Medal of Honor for their gallant participation in that fighting. Today only a few of the mounds remain, since much of the fort has been eroded by the ocean. Until the arrival of Col. William Lamb in July 1862, Fort Fisher was little more than several sand batteries mounting fewer than two dozen guns. Under Colonel Lamb"s direction and design, which was greatly influenced by the Malakoff Tower (a Crimean War fortification) in Sebastopol, Russia, expansion of the fortress began. 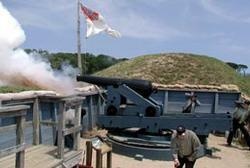 By January 1865, Fort Fisher embraced one mile of sea defense and one-third of a mile of land defense. More than five hundred African Americans, both slave and free, worked with Confederate soldiers on construction; occasionally as many as one thousand men were working, although maintaining adequate labor was difficult. Unlike older fortifications built of brick and mortar, Fort Fisher was made mostly of earth and sand, which was ideal for absorbing the shock of heavy explosives. The sea face, equipped with 22 guns, consisted of a series of 12-foot-high batteries bounded on the south end by two larger batteries 45 and 60 feet high. Of the smaller mounds, one served as a telegraph office and another was converted into a hospital bombproof. The land face was equipped with 25 guns distributed among its 15 mounds. Each mound was 32 feet high with interior rooms used as bombproofs or powder magazines and connected by underground passageways. Extending in front of the entire land face was a nine-foot-high palisade fence. Colonel Lamb recognized the importance of Fort Fisher to the defense system of the Cape Fear, to the security of Wilmington, and to the survival of the entire Confederacy. Massive and powerful, Fort Fisher kept Federal blockading ships at a distance from the Cape Fear River, protecting Wilmington from attack and ensuring relatively safe passage for Confederate naval travel. Wilmington was the last major port open to the Confederacy and the destination of steamers called blockade runners, which smuggled provisions into the Southern states and supplied General Lee"s Army of Northern Virginia. These ships traveled from Bermuda, the Bahamas, and Nova Scotia, where southern cotton and tobacco were exchanged for food, clothing, and munitions from British traders. The Union army and navy planned several attacks on Fort Fisher and the port of Wilmington, but made no attempt until December 24, 1864. After two days of fighting with little headway, Union commanders concluded that the fort was too strong to assault and withdrew their forces. However, they returned for a second attempt on January 12, 1865. For two and one-half days, Federal ships bombarded the fort on both land and sea face. On the fifteenth, more than 3,300 Union infantry, including the 27th U.S. Colored Troops, assaulted the land face. After several hours of fierce hand-to-hand combat, Federal troops captured the fort that night. The Confederate army evacuated their remaining forts in the Cape Fear area, and within weeks Union forces overran Wilmington. Once Wilmington fell, the supply line of the Confederacy was severed, and the Civil War was soon over. Approximately ten percent of Fort Fisher still stands along with a restored palisade fence. All tours of the grounds begin in the visitor center. This recently renovated facility contains an audiovisual program that presents the history of the fort. New exhibits are currently being designed for the visitor center. The North Carolina Underwater Archaeology headquarters is also located on the property. All coastal recreational regulations and licenses apply. A North Carolina Coastal Recreational Fishing License is required for any fisher 16 years of age or older. Return unwanted fish unharmed to the water and do not leave fish scraps on the beach. Fort Fisher SRA is experiencing problems with nest predators such as red fox feeding on turtle and shorebird nests. Leaving food and scraps on the beach attracts predators to areas where they may come into contact with people or feed on endangered and threatended species. Lifeguard service is provided in a designated swim area from Memorial Day through Labor Day. Please obey the warning signs and flags. A green flag indicates relatively calm conditions. A yellow flag indicates rougher conditions and to swim with caution. A red flag indicates severe conditions. Swimming is not permitted under red flag conditions. Registered vehicles with valid park-issued permits are allowed in the four-wheel-drive access area. (Trailers are NOT allowed to be towed onto the beach). Beach vehicle access permits are available for sale at the park"s visitor center daily from 8:00am to 5:00pm with cash, credit cards (Visa, Mastercard and Discover), money orders or personal checks accepted with proper identification. Annual Pass holders are still required to register at office. Permits are $20 weekdays and $30 weekends. Annual passes are available: an Individual Pass is $75 and a Friends and Family Pass is $125. Beach wheelchairs are available for free on a first-come, first-served basis. There are three chairs available from 8:00am to 5:00pm. Please come into the visitor center office and ask staff to assist in getting one for you. Event permits. Some events—such as weddings, athletic contests, company parties, etc.—may require a Special Activity Permit. If you"re unsure whether such a permit is necessary for your event, call the park office beforehand. You can download a Special Activity Permit application or obtain one from the park office. A permit is required for any project involving the collection, removal or disturbance of any natural or cultural resource of any state park unit and for projects that require placing monitoring equipment in any state park unit. Learn more about research and collection permits or fill out a permit application online.